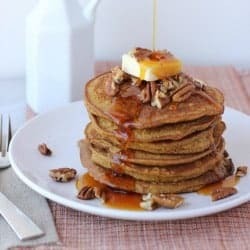 These 4-Ingredient Pumpkin Egg Protein Pancakes are perfect for young babies and adults alike! This healthy, easy breakfast is sure to be a favorite for everyone. Pumpkin season may be here, but this is a recipe I secretly make all year long. 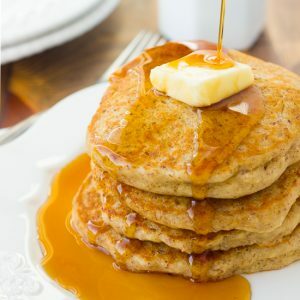 These Pumpkin Egg Protein Pancakes (like these Banana Egg Protein Pancakes) are one of my favorite things to make for my kids! They are healthy, filling and taste like a treat. They make a great, easy breakfast for babies and adults alike. 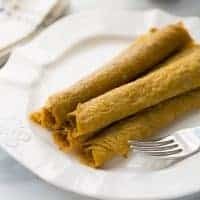 Plus they are perfect for using up leftover pumpkin. 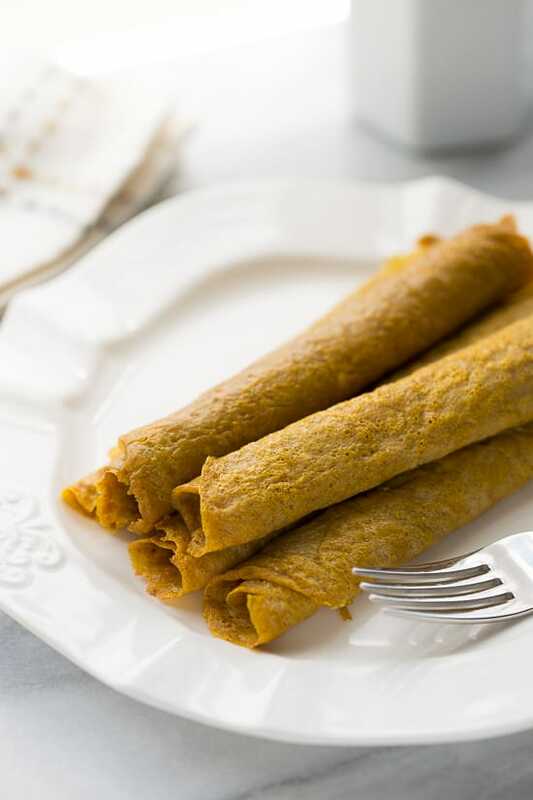 I especially like making these as roll-up pancakes. 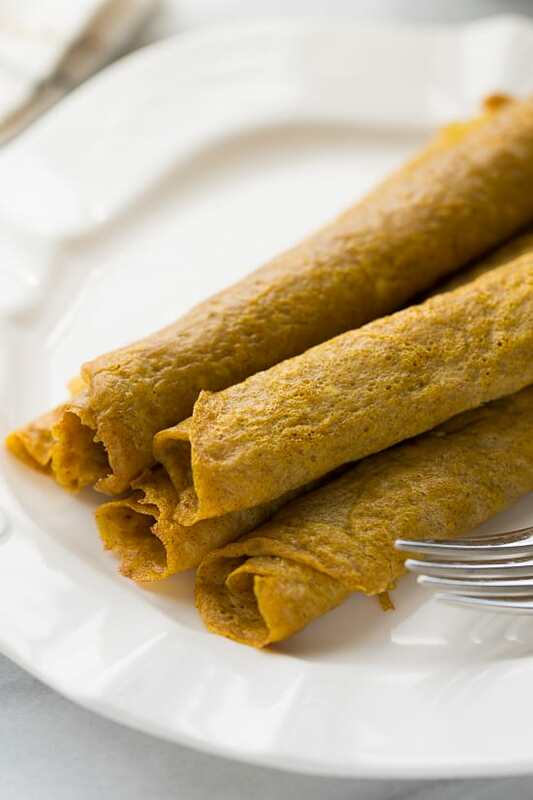 If you use a small nonstick pan and make one pancake at a time they roll up great. You can also cook a few at once in a larger pan if you prefer. Just be sure to cook these on low heat and let them cook for about 3 minutes, or until set, before you try to flip them. My 5-year-old and 1-year-old have been eating me out of house and home lately. I can only image what it will be like when they’re teenagers! I love these pancakes because they keep the boys full and happy all morning. Definitely a recipe worth making all year long! These pancakes are perfect for young babies and adults alike! Double this recipe if you’re feeding more than 2-3 people. In a medium bowl, whisk all the ingredients together until smooth. Spray a small nonstick skillet with cooking spray (or grease with coconut oil) and place over medium-low heat. Pour in about 1/4 cup of batter for a small single pancake. You can also cook a few at a time in a larger nonstick pan. Let the pancake cook on lowish heat until set, about 3 minutes then flip and cook for another 30 seconds on the second side. Roll up for serving if desired. Enjoy! Such a great (healthy) recipe for fall! These look so fun and easy! Like little crepes! Just curious about the nutritional breakdown. Can you provide that info?? Have you ever tried applesauce in place of the pumpkin? I haven’t! I have tried mashed bananas and that works great! Whoa! Thank you for sharing. Looks really great :). I will try to prepare it when i come back home! Hey these look yum but what filling do u use? These are wonderful. Delicious and easy enough for a school or work day breakfast. Good cold as a snack too! My son put some Nutella on one the other day and said it was great.